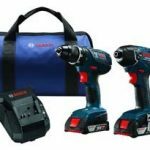 Which one of these two drill and driver kits is better? The answer may surprise you. Let’s take a closer look at Ryobi’s products to help you decide which one best fits your needs. The Ryobi P1832 drill and driver kit is perfect for homeowners, hobbyists, and pros who want a light-duty set of power tools. 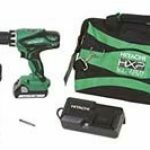 It contains a general purpose drill, an impact driver for fastening bolts and screws, two lithium-ion batteries, a charger, and a handy carrying case for everything. The batteries and charger are part of Ryobi’s ONE+ system so you can use them with other ONE+ tools. And the charger is also useful for refilling both Ni-Cad and lithium ion batteries because it’s dual chemistry. The P277 drill isn’t just good for making holes. 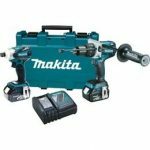 It has a ½-inch chuck so you can use a wide variety of bits and attachments with your drill, from hole saws to sanding pads. You’ll also have good control over torque with its two-speed transmission and clutch with 24 settings.The low gear ranges up to 440rpm and the high gear up to 1600rpm (without a load). You’ll notice that the drill is nicely balanced and its soft grip handle feels good in your hand. It weighs only 3.1 pounds, a lot less than that corded pistol-grip drill you have in storage. It’s also loaded with thoughtful features for the user. For example, it comes with two-ended driver bit that tucks into a slot at the foot of the handle. It also has a magnetic tray that stores screws so you won’t lose track while you’re working. As for the P235 impact driver, It’s also lightweight and compact, weighing only 2.64 pounds. You’ll see it also has a magnetic screw tray to keep your fasteners handy. Its belt clip lets you hang it nearby while you make holes with the drill. Then it’s simple to swap to fastening with the included two-ended driving bit. You won’t need to waste time swapping bits since you can change between tools. But, just so you know, the ¼-inch quick couple design of the impact driver makes it even simple to change bits. And the driver has up to 1600 inch-pounds of torque to sink lag bolts and screws in record time. It spins up to 2600rpm (without load). Finally, Ryobi’s IntelliPort charger is compatible with both Li-Ion and NiCad 18-volt batteries. Now you’ll only need one charger for all your Ryobi power tools. Plus, if you leave the batteries on the charger, you don’t need to worry about them. The charger maintains them in top condition. may have realized that the P882 drill and driver kit is almost the same as the P1832 kit reviewed above. They have the same exact batteries and the same dual chemistry charger. They come with double-ended fastening bits and a belt clip for the impact driver. And both have a carrying bag as well. The difference between them lies in their selection of tools. 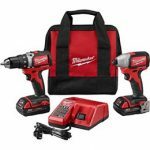 The P882 kit includes the P271 drill and the P234G impact driver. 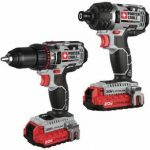 The P271 ½-inch drill has almost the same specifications as the P277 drill above—they weigh the same, they both have two-speed transmissions, and 24 clutch settings. The only difference is that the lower gear on the P271 drill goes up to 440rpm. As for the P234G driver, its maximum torque of 1500 inch-pounds is a little bit less than the P235 driver, but it weighs the same and has the same top speed of 2600rpm. So yes, it’s a tough choice between kits. For our input, see the recommendation below. 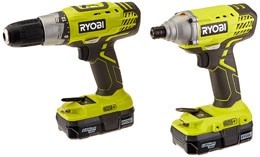 It’s a close race between the P1832 and the P882 kits from Ryobi. They have almost the same exact features, down to the magnetic screw trays. Our recommendation is to select one based on your budget. Chances are that you’ll find one or the other on sale. 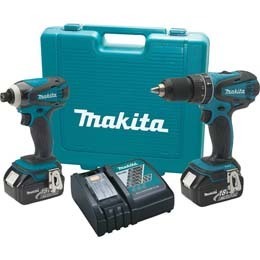 Other than that, you might simply prefer the slightly more powerful P234G impact driver in the P882 kit. 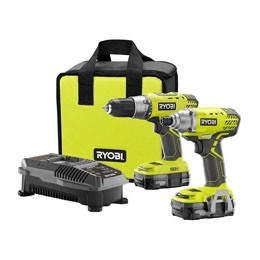 Click here to purchase Ryobi P1832 on Amazon.com! 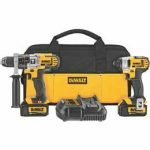 Click here to purchase Ryobi P882 on Amazon.com! Drill Driver Comparison and Reviews Copyright © 2019.